As a general rule, it's not good to be a snob. It's a quality that's usually considered unbecoming of one's character. However, when it comes to coffee, I think being a coffee snob is nothing short of a virtue. The world of k cups® and coffee pods is often regarded as a step down from whole bean coffee. While it's true that whole bean will always result in the freshest coffee experience, I think many coffee lovers out there would still be surprised by how far the technology of the coffee pod has come along. Along those lines, I've put together a brief list of the best k cups for coffee snobs. The world of k cups® and coffee pods can be a mixed bag. Always be sure to check the freshness date of any coffee product you purchase. Even the best k cups and coffee pods are subject to an expiration date. To some, the thought of the best k cups® for coffee snobs seems like any oxymoron. I get it. But again, having been labeled a coffee snob myself, I've been impressed with the increasing standards of quality and taste that the industry has displayed. This list below of the best k cups for coffee snobs is simply my personal opinion based in having tried all of them. 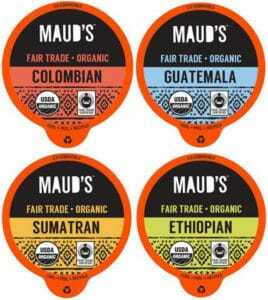 Maud's Coffee is a brand that we were touting long before it became a more mainstream coffee hit. They make great coffee that's super smooth. I'd especially recommend this to anyone who appreciates low acid coffee. A friend of mine who had actually given up altogether on coffee because the acid was getting to her, was able to keep stay in a relationship with coffee since she discovered Maud's Coffee. See her full Mauds coffee review. I can confirm is one of the best medium roast k cups and coffee pods on the market. Starting off our list is none other than illy coffee. This may be a totally OCD tendency, but it had always bothered me that the “i” in illy wasn't capitalized because I felt like it understated how good the coffee was. 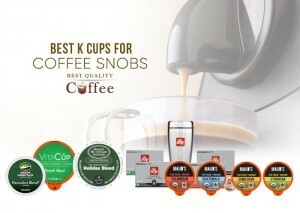 Anyways, illy has been credited with pioneering the modern espresso industry and with such a storied history behind them, it's no surprise that their k cups are everything you'd expect. I was thoroughly impressed with especially their illy decaf k cups. Strange as it may seem, I often use the quality of a coffee company's decaf blend as a gauge of how it treats customers who make up a smaller percentage of market share. Illy doesn't dissapoint. 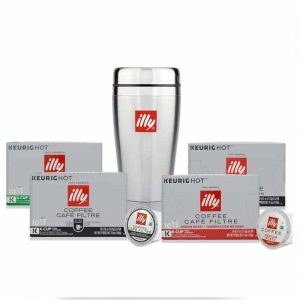 Illy k cups are extremely fresh and full of a richness that anyone familiar with illy coffee will immediately recognize and appreciate. No list of best k cups for coffee snobs would be complete without Green Mountain coffee. Over the years, Green Mountain has set the standard when it comes to freshness and quality in the coffee pod industry. They represent one of those rare cases in which a company only increases its quality with growth instead of the other way around. 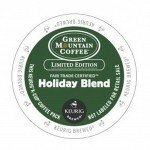 Green Mountain K Cups come in an infinity variety of flavors from specially-crafted holiday blends to bold dark roasts that will knock your socks off. If you're new to the K Cup world and want to ensure that your first coffee experience is a deeply satisfying one, check out our selection of Green Mountain K Cups. 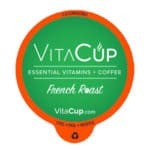 Vita Cup coffee pods made it to the list of best k cups for coffee snobs not just because they produce an exquisite cup of coffee, full of richness and deep flavor. But probably its most impressive quality is the fact that VitaCup comes infused with a variety of vitamins and minerals that help with the natural boosting of your immune system. The whole idea of healthy coffee pods or healthy k cups is a concept that's been gaining much traction in an increasingly health-conscious world. The key to its success as a trend is being able to preserve taste while adding health benefits. Vita Cup has accomplished this. We've been thoroughly impressed by Vita Cup's coffee products and their customer service has been top notch. That's always something to consider when sampling a relatively new company and I'm happy to say that the company has been very responsive. Keeping it simple, we tried their coffee and we loved it. I could write more about it but for the sake of brevity, I'll refer you to the full Vita Cup review. 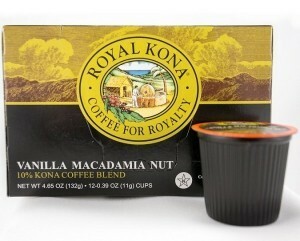 Rounding out our list of the “best k cups for snobs” is a Kona's lovers dream come true. Royal Kona is already known for producing some of the best Kona coffee and consequently best Kona K Cups / Coffee pods in the world. Their vanilla macadamia Kona blend is a delightful mixture of subtle nutty flavors accented by the distinct Kona influence. As a coffee snob, it's your obligation to maintain the higher standards possible when it comes to your coffee. I think most coffee lovers will appreciate the smooth finish of this particular blend. To learn more about this highly valued type of coffee, check out our Kona coffee review and guide. I AM A BIG COFFEE DRINKER AND I WOULD LIKE TO TRY THE COFFEE.